Gov. 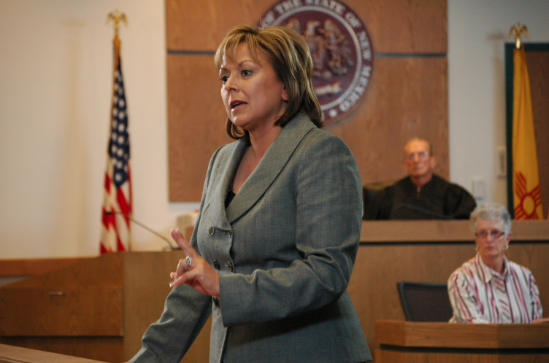 Susana Martinez (R-N.M.) earned the highest grade on the 2018 edition of the Cato Institute's "Fiscal Policy Report Card on America’s Governors"
Thankfully, there’s an avenue for inquiring minds to learn how governors are managing their state’s finances. Today, Cato Institute released its biennial fiscal report card on America’s governors. The Cato Institute’s report, Fiscal Policy Report Card on America’s Governors 2018, examines each governor on their records on taxes and spending, assigning him or her with a letter grade. These reports have been coming out every two years since 1992. Steve Moore, who is currently a senior economic contributor for FreedomWorks, authored the first report card. Chris Edwards, the director of tax policy studies at the Cato Institute, has authored the report card since 2008. The report card is the first since the passage of the Tax Cuts and Jobs Act, which prompted some states to pursue their own tax reforms. There are other recent regulatory factors that may impact revenues. Although some of these, such as the Supreme Court’s decision in Wayfair, may not be realized until next year when states begin looking at legislation that addresses online sales taxes. Still, there has been plenty of activity in state legislatures to determine whether governors, who have the power to sign or veto legislation, have acted fiscally responsible manner. Others who received high marks are Gov. Henry McMaster (R-S.C.), Gov. Doug Burgum (R-N.D.), Gov. Paul LePage (R-Maine), and Gov. Greg Abbott (R-Texas). Gov. Burgum and Gov. McMaster took office in December 2016 and January 2017, respectively, so they’re off to good starts in terms of vetoing tax hikes and/or restraining spending. Gov. LePage is in the final year of his last term. Although he often makes politically incorrect remarks, there’s no question that Gov. LePage has governed as a strong fiscal conservative. Gov. Abbott has served since January 2015 has kept spending low and cut some taxes and fees. Eight received grades of “F.” Those who received these low marks are Gov. Rory Cooper (D-N.C.), Gov. John Bel Edwards (D-La. ), Tom Wolf (D-Pa.), Gov. Jim Justice (R-W.Va.), and Dennis Daugaard (R-S.D.). The worst in the nation from a fiscal perspective, however, is Gov. Jay Inslee (D-Wa.). Now, the report notes that most of what Gov. Inslee, who signed a 17 percent spending increase into law, has pushed for has not made it through the Washington State Legislature, but he continues to push for higher taxes. “In his budget for the 2017–2019 biennium, Inslee proposed increasing the state’s business and occupation tax rate to raise more than $1.1 billion a year, creating a new capital gains tax of 7.9 percent to raise more than $800 million a year, and creating a carbon tax to raise more than $900 million a year,” the report adds. Of course, there are 36 gubernatorial races in the 2018 election cycle and three in 2019. Several of the governors score in this year’s Cato Institute report card are term-limited, some may lose re-election, and others are retiring. Needless to say, there will be fresh faces in the 2020 report card. Good article, she is very talented, I appreciate your talent.